By a show of hands, how many of you are kind of nervous about making new friends? If you’re sitting at your computer with your hand in the air… wave it around…. put the other hand up…. okay now put them down, you look ridiculous. The thought of going to college and not knowing anybody and then having to make new friends it extremely frightening. Will people like me? Will I like the people at my college? Will they ever be as good as my high school friends? Theses are all natural concerns but let me say this… take a deep breath, you will make friends, you will have fun, people will like you. Here are things to think about as well as a couple pieces of advice on how to make friends. 1. Everyone is in the same boat as you – yes, some people will know friends who go to the same school but for the most part everyone has arrived to college alone and everyone wants to make friends and everyone is probably a little nervous to make friends. 3. Don’t spill your soul – when people, especially us girls, are making new friends we tend to spill the beans about our whole life. Usually people hang out together outside or around in a dorm room and talk to get to know each other. I remember girls who started to cry and talk about family problems, old boyfriends, personal information… it was bizarre. It’s important not to spill the beans right away because a) you can’t trust these peeps yet to keep there mouth shut (they don’t even know you so they don’t owe you the code of silence) b) you have a clean slate do you really want to be bringing up your past? This is a time of your life to create new memories! Keep moving forward! 4. You will have different friends the end of your freshman year than you did the beginning of your freshman year. This happens so often. Sometimes it will just be a couple new friends other times, you entire group of friends will change. Again, another reason not to spill your guts to your new friends the first weekend of college because heck, they might not be around at the end of your freshman year and do you really want them knowing your secrets? 5. Keep your options open – don’t just look for the people who remind you of your friends from high school. There may be other ‘types’ of people who will actually be better friends for you than your high school friends, outrageous right? It’s true though so keep your options open and be nice to everyone. 6. Join clubs – if you join a club that interests you, you are going to meet other students who have similar interests. It’s an easy way to make friends. 7. Fun thought – you will make friends of all ages. One of the coolest things about college is that when you stand in the middle of your campus and look around, you won’t be able to tell who’s a freshman/sophomore/junior/senior and we all know you can pick them out in high school now. 8. Talk to people – common sense right? It may take you our of your comfort zone but simply open your little scared freshman mouth and say hello to people. When’s the last time someone said hello to you or was nice to you and you thought ‘omg that person was so nice and said hello, what a b*tch’…. uhhh, never! 10. Get a job – you will be surprised at how much free time you have at college. Look for a part time job on camps. It will be a great way to make a little extra spending cash, keep you busy, and make new friends. I think I’ve said this before but my best friend in the entire world, the girl I can’t image living without, and the person who will be in my wedding party (when that day comes), I met in college. Cheers to making new friends! 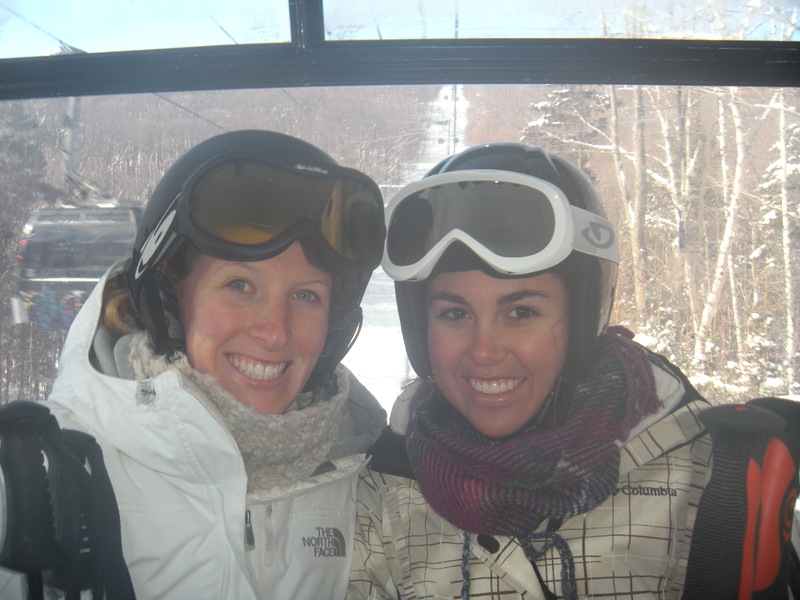 COLLEGE PHOTO: My best friend and I on a winter ski trip. This entry was posted in Extracurriculars, Friends and tagged college, join clubs, making friends, new friends. Bookmark the permalink.